Enterprising local Hilary Hodge (social media marketing manager, writer, and executive director of Sierra Commons) volunteered to launch and manage a Twitter feed for the Democratic Party of Nevada County just two months ago, and the account is now receiving national recognition — the latest kudos coming from prominent progressive political commentator Rachel Maddow, no less. 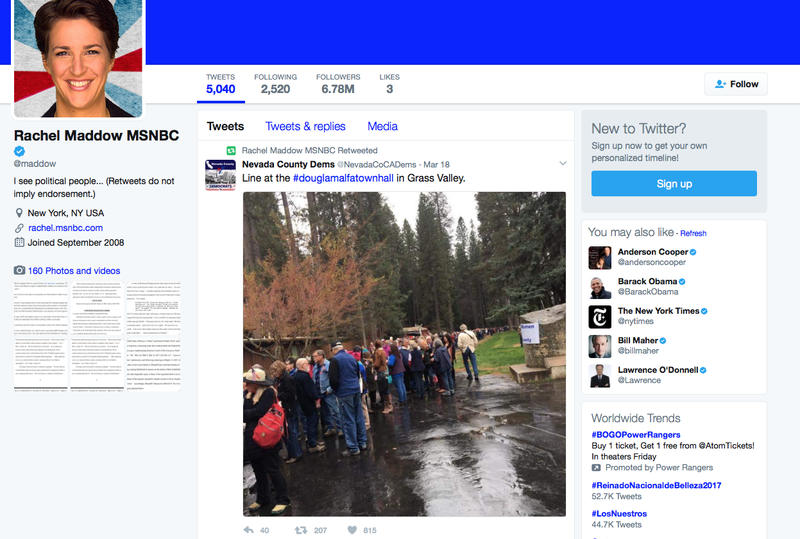 This weekend Maddow retweeted a tweet from “Nevada County Dems” (@NevadaCoCADems). It was a photo from the local Dems Twitter feed, which reported on Congressman Doug LaMalfa’s Town Hall meeting at the Nevada County Fairgrounds in real time this past weekend. The headline read: “Line at the #douglamalfatownhall in Grass Valley.” And it was a long line. (See screen grab below). Maddow’s Twitter feed has 6.78 million followers. Her show on MSNBC has experienced gigantic ratings growth as MSNBC’s primetime audience grew more than twice as fast as Fox News in the first quarter, according to an MSNBC press release. That is a big megaphone for the Nevada County Democratic Party — in what has long been a “red” county! The local left has been reinvigorated, as this blog has been reporting. This is the latest example. It comes amid a continued shift to the left in local politics, as we’ve been reporting. One of the reasons is here. By contrast, the local right looks tired and shrill, at least judging from local opinion articles in The Union by longtime local hard-right activists Fran Freedle and Todd Juvinall. Freedle lashed out at The Union, and Juvinall lashed out at Hodge. Both articles were juvenile and had no merit. The local right needs more sophisticated-sounding spokespeople and some “new blood.” A memo from the local GOP leaders became featured political satire in the Sacramento Bee, drawn by Pulitzer Prize-winning cartoonist Jack Ohman. What a hoot! We are on the move! Thanks to everyone who is marhcing, demonstrating, attending meetings, calling, putting data in the database, organizing, etc., etc. etc. Great to see us featured on Rachel’s show last night! You have been persistent over the years I have known you. It is paying off. Hope all is well. The large size of the crowd at the fairgrounds seem commensurate with the locals’ level of discontent. Bereft of mining or logging dollars it has yet to find an effective economic engine to bring adequate security, much less prosperity, to its citizens. Many locals lack the “skills to pay the bills” in the current workforce, or are too old or sick to work, so the bills pile up. Infrastructure is in major disrepair everywhere and it’s getting warmer steadily every year. If the atmosphere’s temperature rises only one degree per year, in ten years what will happen? And how can Doug LaMalfa help? He will be financially wiped out if he can’t grow rice, especially if there is no one to buy it. And he might be much too busy, trying to keep his family alive, to offer us any advice from scriptures once our planet has become a living Hell. Bruce, what are you trying to say with all these stats? My point is that describing Nevada County the way Trump describes the country (during the last 8 years) doesn’t make it so in either case. Trump is probably a destabilized climate denier, so I still don’t get your point. You’re telling me that things are just peachy in Nevada County? Robust economy, healthy population, plenty of affordable housing, good jobs, great services and all that? Well, that’s welcome news, what a relief to learn that there is nothing much to fix here. There’s a whole spectrum between “Robust economy, healthy population, plenty of affordable housing, good jobs, great services and all that?” and your description. Things are not “either or” or “black or white”. That’s a very limited and confining view. But if that’s what gets you through the night, enjoy. Well, now we know what your standards are Bruce. Maybe you are right, perhaps Nevada County should always aspire to mediocrity. The National and the Alpha in our downtown make great relics. Losing lodging, shops and restaurants? No bank in town? Buildings too expensive to buy and restore? No problem, there’s always Auburn or Roseville, minutes down the hill, for just about anything you need. You really are a piece of work. And many people here are not stupid. They see your BS exactly for what it is. Narcissism has no self awareness, fortunately for you. I just hope you see this before Jeff removes it, as he no doubt will. But I don’t think that will happen. And you don’t know s**t about me or my standards. I find it hard to believe that Jeff leaves you on here unrestrained. Says something for both of you. Bruce, Dude have you heard of the 1st Amendment? Oh? Really! The right to say what you want doesn’t preclude being called out on it, does it Mr. Constitutional scholar? BS is BS. And while we’re at it, Russ who? Russ? Please use your full name. Thanks.